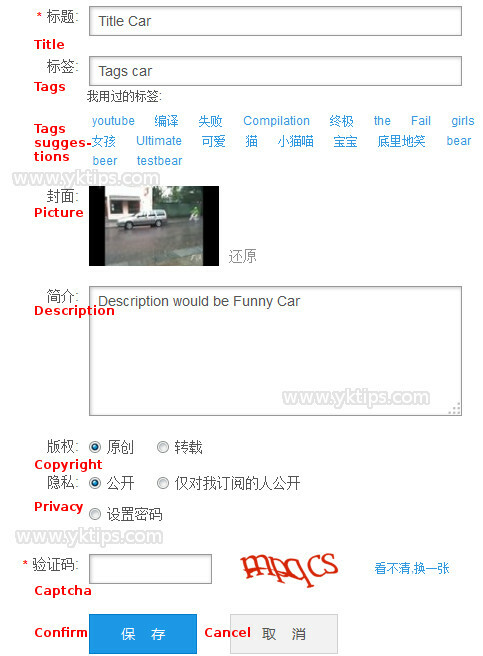 How to manage videos Youku, in this section this English guide will show you how to manage videos on Youku.com . This English guide also shows you how to manage your channel and your videos on your account. It shows you how the channel page looks like and how to modify your videos, all translated into English. Trans-coding- Upload complete, process video into their format. Review – Being reviewed by staff. The reviewing takes some time, which means your video can’t be viewed until review by their staff is complete. You can edit the title, tags and description of an existing video. when you click on Edit, you will go to the next screen with these editable text fields. See the image for more information. To save your modifications, You need to enter a Captcha and press the blue button. When you press Delete, you will see the next box. It says you need to enter your password to be able to delete your video. On the top right side, when you clicked your user name, you can continue to edit your profile. 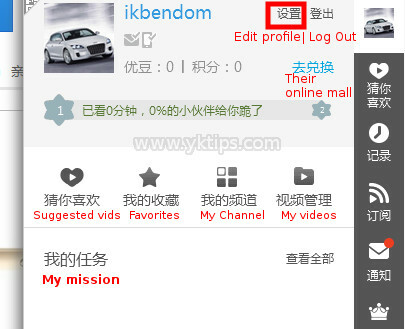 You can also log out from Youku. The rest is also self-explanatory. There are some quick-links which will lead you to what you click. You may want to read about earning money with Youku.